Below: Deputy Fire Chief Jack Gelinas and now Asst. 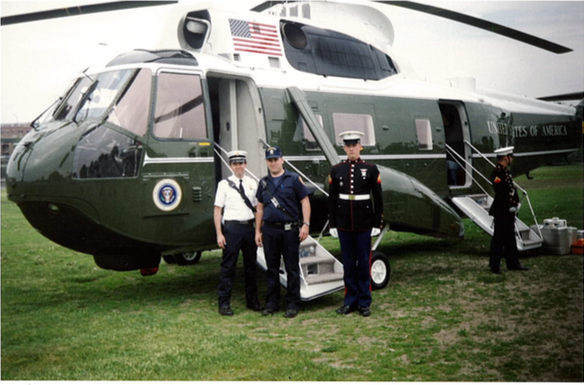 Fire Chief Gerard E. Mahoney (a firefighter then) beside a presidential helicopter May 21, 1989. That day, helicopters delivered President H. W. Bush and French President Francois Mitterrand to Magazine Beach, to a speaking engagement at Boston University. Thanks to Asst. Fire Chief Gerard E. Mahoney for sharing the photo and his memories of the event–below. On May 21, 1989 President George H. W. Bush and French President Francois Mitterrand delivered a joint commencement address at Boston University on Nickerson Field. A decision was made among the US Secret Service and local and state law enforcement to have the helicopters land at Magazine Beach. I was working that day as the Aide to Deputy Fire Chief Jack Gelinas. He called me at home the day before to alert me to what our assignment would be for the day. We had fire department assets staged at Magazine Beach several hours before the presidential party arrived. They flew down from Kennebunkport where the Bush’s had hosted the Mitterrand’s. As a young firefighter I can tell you it was an awesome experience. There were three identical helicopters commonly known as Marine 1. Only seconds before the landing were we told which one was carrying the two Presidents. The two first ladies flew on another chopper and White House as well as French staff were on the third. They were accompanied by two very large “birds” as they call them which were carrying the White House Press Corps. While the commencement was going on we all had the opportunity to tour Marine 1 but it was not the actual helicopter carrying the President. We also had a great group photo taken in front of Marine 1 with the President’s pilot who was a Marine Corps Colonel. Do you have stories of Magazine Beach? We’re collecting them. E-mail them to cathzusy@gmail.com. I remember that day when the two Presidents landed at Magazine Beach and were driven over the BU Bridge to the BU commencement. I was on my bike on the BU Bridge when the cars came over and I got an enthusiastic wave from President Bush. I imagine that these days nobody would have been allowed on the bridge for an hour before or after they came across and agents would have checked the bridge for threats. Things were a lot simpler 25 years ago.